Much to the chagrin of some, a Nobel-winning scientist insists that DNA can effectively teleport itself to nearby cells. In many sci-fi stories, teleportation is achieved by digitizing the human body and sending it, at lightspeed, somewhere else to be re-assembled. According to Luc Montagnier, DNA already does this. Rousing the ire of many chemists, Montagnier is shopping a paper around for publication which essentially states that DNA emits a weak electromagnetic field which can imprint the information contained in the molecule via a bunch of quantum stuff which I'm just going to call "magic". 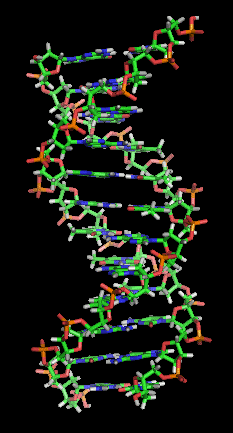 Using this "magic", the DNA imprints its genetic information in nearby water strong enough that the enzymes in cells responsible for copying DNA mistake it for being real DNA. They then go about their business of copying this ghost-DNA, producing a real copy of the teleported genetic information. To prove this, Montagnier sealed 2 test tubes away from the earth's magnetic field, one containing a 100 base long strand of DNA, and one containing pure water. He proceeded to do a bunch of science things I don't understand, but essentially he put them in a copper coil and applied an electromagnetic field of 7 hertz to the two tubes. He then ran the contents of the tubes through a polymerase chain reaction, which basically is an enzyme that copies DNA. The DNA string was found in both tubes. The experiment has not yet been peer-reviewed or even officially published, so it could all be a figment of Montagnier's imagination, but that doesn't prevent the results from causing a stir in the scientific community. "If the results are correct, these would be the most significant experiments performed in the past 90 years, demanding re-evaluation of the whole conceptual framework of modern chemistry," says theoretical chemist Jeff Reimers of the University of Sydney. Not everyone agrees with Reimers, however. Klaus Gerwert, an expert in how water and biomolecules interact says, "It is hard to understand how the information can be stored within water over a timescale longer than picoseconds." Felix Franks, known for helping to debunk similar findings in a 1988 paper, says "The structure would be destroyed instantly. Water has no 'memory'. You can't make an imprint in it and recover it later." I don't know about you, but I am eagerly awaiting some peer-reviewers to determine, for certain, if I am built of magically teleporting quantum molecules.